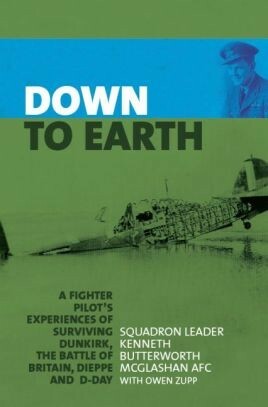 In Down to Earth, Squadron Leader McGlashan reflects honestly on his enthralling and diverse RAF career, one that began with the rag and tube of Hawker biplanes in 1939 and closed in the jet era of the late 1950s. Shot down over the beaches of Dunkirk in heated aerial combat, we follow the footsteps of the nineteen year old along the debris-littered sands and beyond. From the protection of vulnerable convoys to the pioneering days of night-fighting and airborne radar, McGlashan is in the midst of the action. Flying in support of the ill-fated landing at Dieppe and on clandestine night operations before D-Day, he takes an active role in some of the RAF’s most significant operations of World War Two. Interspersed throughout are tales of camaraderie and humour. Away from the front line, McGlashan was seconded to BOAC to fly airliners out of Cairo, tasked to ferry all manner of aircraft at the war’s end and serve Cyprus at the height of a very nasty campaign. It is a journey of tremendous diversity, punctuated by a series of close calls and inevitable losses. Half a century later, retired and living in Australia, Kenneth McGlashan is drawn back to 1940 with the discovery of his crashed Hurricane surfacing through the sands of Dunkirk. In an emotional pilgrimage, he is reunited with the steed of his youth and its bullet-ridden cockpit. In spite of the many dangers he faced and despite evidence to the contrary, McGlashan regarded himself as nothing more than just another pilot; an ordinary man in extraordinary times. Of the 3,000 allied airmen who flew in the Battle of Britain, only three percent could lay claim to the title of ‘ace’, Squadron Leader Kenneth McGlashan AFC always felt great honor in being counted amongst the 97 percent. Zupp’s writing has featured in many aviation magazines including Flypast, Flightpath and Rag and Tube.